← Happy International Hot & Spicy Food Day!!!! It’s Sunday, It’s Sushi, It’s Saucy Everything!!!! Intensity Academy Stays Saucy Once Again! Saucy Everything Adds spice and dimension to Sushi! I’ve been craving Sushi lately! So today after church I stopped and picked up a Spicy Tuna Roll. I don’t often crave sushi, but I’ve had a really good reason….I needed a vehicle for Intensity Academy’s latest offering…..Saucy Everything! This spicy creation from Michele Northrup’s kitchen is a “mayoish” sauce that sends subtle messages like “Put me on Sushi!” And “Hey You! Miracle Whip?! Seriously?! Do your Ham and Cheese a favor and get lost!” Really…..I think I actually heard voices…..little voices…….okay, fine, it’s the medicine, but this stuff would if it could! And speaking of medicine, Saucy Everything has what ails ya! Looking at the ingredients, it starts out sounding like Mayo….egg yolks, canola oil, lemon, etc. But then this spicy concoction spreads it’s fiesty little butterfly wings and takes off into flavor tow…….Oh wait, that’s the line the uber cool, spiky hair dude from Food Network uses…..so let’s say “Flavor Village”! Cause we all know it takes a village! Okay, I digress…… But it is the inhabitants of this Spicy, Saucy Village that makes Saucy Everything so special…..they veer off from the boring, middle class existence that mayo inhabits! With organic chai tea (one of Michelle’s signature ingredients), thai peppers, red jalapeños, rice wine vinegar, garlic, cane sugar, and other spicy villagers, this sauce offers so much more than almost anything you could pick up in the grocery store! Intensity Academy Saucy Everything shows a ham sandwich some spicy love! 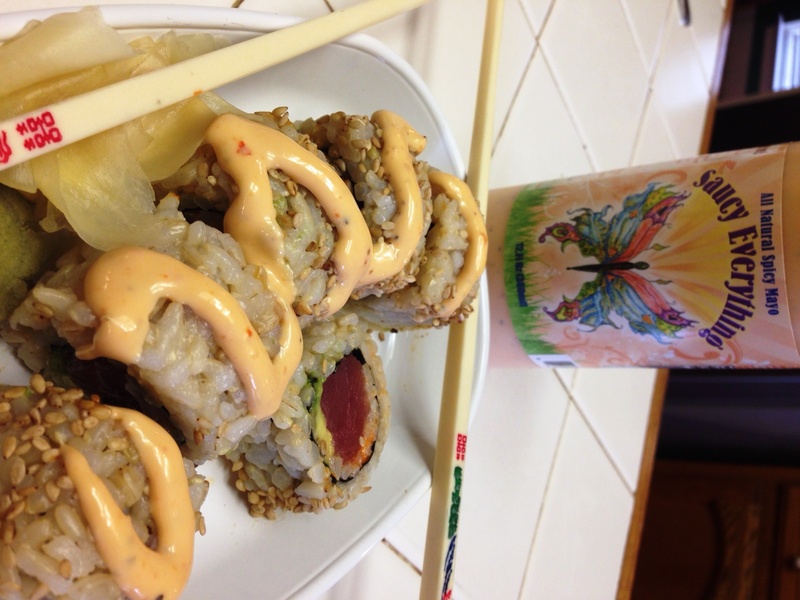 Saucy Everything enhances and works with so many foods….. it complimented my spicy tuna sushi roll perfectly. The peppers, garlic, and vinegar combined to add a nice undertone to the tuna while at the same time rescuing the boring brown rice from itself! 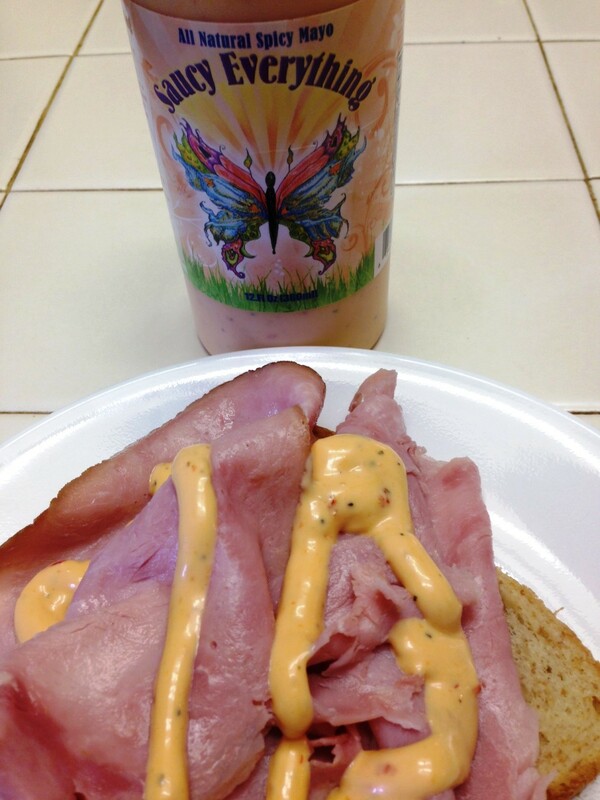 And on my ham sandwich, it brings out the savory notes in my sweet ham, adding to the satisfaction and announcing to the village that “no one boring lives here!” And on a BLT….OMG! Bacon (candy of the Gods), Lettuce, and Tomato never had a better neighbor! What kind of neighbor, you ask? Well, imagine if Angelina Jolie and Brad Pitt moved in next door! Your neighborhood instantly added a layer of exotic beauty and spice that never existed before! That’s what I think of when I use Saucy Everything! Well, fine, it doesn’t take much to make me think of Angelina Jolie, but hey, the analogy totally works! So, what’s the verdict!? 4 1/2 Fiery Worlds from this reviewer! It is another addition to the outstanding stable of products that Intensity Academy offers! So go out and get you some! I gave you just a few examples of Saucy Everything’s potential uses! Heck, use it for a dip! In your deviled eggs! Cole Slaw! Potato Salad! Yea, I’m going through the whole mayo stable of uses, but that’s the point! Send your mayo packin’! Add some Saucy Everything to that village you call a refrigerator! But why, you ask? Because, Ladies and Gentlemen-It’s a Fiery World! Ken Alexander is a self-proclaimed Chilehead, with a love of spicy food, hot sauce, and the zest of life. Ken lives in Baton Rouge, LA, in the heart of Cajun Food country, and enjoys experiencing new tastes and flavors from all over the world. In addition to managing It's a Fiery World, "Ken's Fiery World" is a regular podcast segment on Scott Roberts' Weekly Firecast, where they discuss all things hot, spicy, and tasty! Ken is also a staff reviewer for the video based review site ILoveitSpicy.com and has been a contributor to the Premier spicy food blog HotSauceDaily.com. Ken also likes humming TV theme songs, playing Yahtzee, and quoting old Kris Kristofferson lyrics. But above it all, Ken love to celebrate our collective "Fiery World"!! 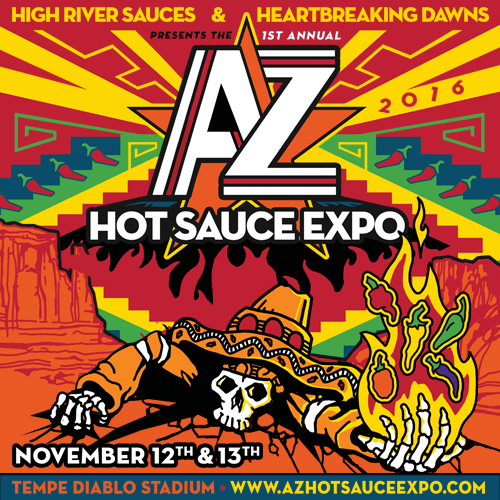 Posted on January 26, 2014, in Hot and Spicy Food, Hot Sauce Review, Hot Sauce, Spicy Food, hotsauce, Fiery World, It's a Fiery World, Spicy Food Reviews, Uncategorized and tagged fiery world, Hot Sauce, Intensity Academy, It's A Fiery World, Ken Alexander, Mayo, MIchele Northrup, Saucy Everything, spicy food, Spicy Food Review, Sushi. Bookmark the permalink. 2 Comments. Thank you for every other informative site. Where else could I get that kind of info written in such an ideal manner? I’ve a mission that I am just now running on, and I have been on the look out for such info.